The original Moov launched in 2014. The wristband, was built by former Apple employee engineer Nikola Hu with cofounders Meng Li and Tony Yuan. The 2015 edition is an upgraded version of the original. Moov’s latest wristband is like a personal trainer on your wrist – it offers real-time coaching feedback, and support for running, swimming, cardio boxing, and bodyweight workouts. The Moov Now is a slick looking device which in some ways resembles the Misfit Shine. It is, however, slightly bigger and not as discreet as the Misfit wearable. The Moov Now is 44% smaller than the original, has holes for “breathability”, and features a redesigned strap and much improved battery life. It is available in four colors: Aqua Blue, Fusion Red, Blizzard White and Stealth Black. The hardware is composed of an accelerometer, a gyroscope to detect rotation, and a magnetometer that detects direction of movement. Moov works on its own but can be used along with a Bluetooth heart-rate strap. The wearable’s modular design allows for Moov to be worn where it is most beneficial for each sport it tracks. For example, you can wear it on your ankle or shoe for running, or on your wrist while kickboxing or swimming. Battery life is up to six months – a substantial upgrade from the 24 hour battery life in the original version. It’s nice not having to charge it, but you will need to eventually manually replace the battery. The batteries are however dirt cheap. The device pairs with an app to train users on five sports — running, cycling, swimming, cardio boxing, and a seven-minute bodyweight workout which you can perform at home as it doesn’t require the use of any weights. With the help of its mobile app and a pair of headphones, the Moov is able to provide the benefit of real-time coaching. The tracker has been tailored to each individual activity, so offers separate exercise programs. For example, for running or walking, the device needs to be strapped to your ankle. There are workouts for brisk walking, pace running, sprint intervals, distance running and open training. The wearable’s motion sensors track the position of your feet in real-time, allowing Moov to deliver data and provide real-time coaching feedback. This is something that is not offered by competing fitness bands. Not only does it coach you on pace, the Move also tries to correct bad form. Workouts can be adjusted for various fitness and experience levels. After a workout you are provided with a range of statistics including steps per minute, range of motion, impact score, elevation, pace, distance, calories burned, and a map of your run via the GPS on your phone. The Moov Now takes a similarly detailed and motivational approach to most of the rest of its workouts. The seven-minute workout for is done using your own body weight. The workout includes several levels so you can push yourself to progress up the level intensity. The levels include variations of jumping jacks, planks, lunges, squats, push ups and crunches. There is a demonstration video for each exercise, and a motion gauge to indicate whether you’re performing the exercises correctly. The Moov Now is also waterproof down to three meters, so you can also wear it in the pool. The swim program doesn’t provide real-time coaching understandably – you couldn’t have the phone in close enough proximity for that to be possible. Once you are out of the pool, however, you can check data on lap times, flip-turn times and stroke rate. The feedback also provides advice on how to improve your swimming technique. While step counts and calories burned offered by most fitness trackers remind you to get out and get active, Moov is able to do much more as it can measure a far wider range of motion. The device essentially translates your exact movement into real-time coaching, both through audio and on screen, and advises you whether you are performing your exercises correctly. It does this through use of the 9 axis motion sensing system – including an accelerometer, gyroscope and magnetometer to learn the wearer’s form and correct any issues that may lead to injury. In addition to tracking the frequency and duration of your workouts, the device also tracks the number of minutes you were active, and the amount of sleep and “restorative” sleep you’ve had. Sleep tracking is a function that wasn’t available in the original version of the device. The Moov is a wearable fitness coach that actively monitors your tendencies, advises you on how to get the most from your workouts, tracks your progress, and motivates you to ahieve your fitness goals. The adition of real-time feedback places Moov in a category of its own in terms of the information that it can provide. Moov has been designed to find your limit, whether it be endurance, power, strength, or cardio and push you to improve. Coaching includes, for example, warnings when your cadence falls behind target, along with tips and reminders to help you maintain or improve your technique. This ends up being more important than it sounds, since poor technique can cause injury. If you’re looking for something to provide that extra boost of motivation – the Moov Now is a great companion. Check out the official product video. These days, keeping fit is rapidly becoming the trendy thing to do, and there’s a whole range of gadgets and fitness trackers aimed at helping you reach your goals. In this crowded market, Moov has carved out a niche for itself. The truly novel feature of the device is real-time coaching feedback in a wide variety of exercise programs. The device tracks your movements, analyzes them and gives you a comprehensive report on how you are doing, after, as well as during the workout. 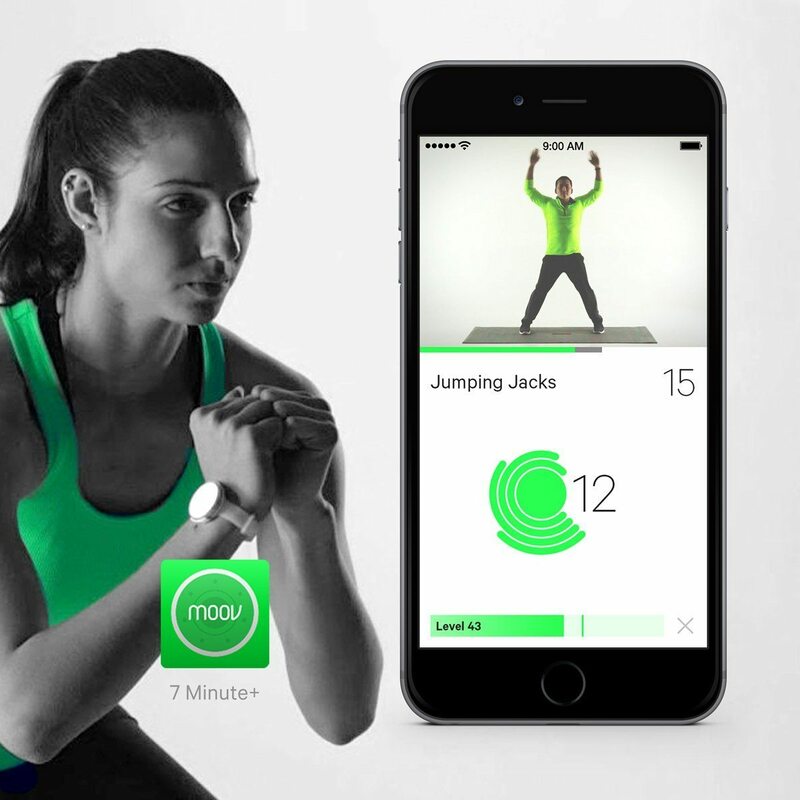 The original model was meant to be worn only during workouts so was not intended to be used as a standard activity tracker – in contrast, the Moov Now is designed for all-day use. While it does not measure steps like a Fitbit or Jawbone, the Moov Now will measure your activity level and active time, in addition to automatically tracking your sleep at night. Even in this niche, some improvement, especially in the software side and in terms of an interface to track progress and compare similar workouts, would be necessary for it to be a mature product. A heart-rate monitor and a screen on the device are definitely features we would like to see in the future. All in all, this fitness tracker aims to teach you the concepts of a healthy life. It provides a fun way to work out and will appeal both to the average person trying to become more active, and the hard-core fitness enthusiasts aiming to improve their technique.